Donating at least 18 € you will have the possibility to register on alternativaslibres.org for a whole year (once your subscription expires you'll have the option to renew it for another year for only 12 € if you renew it within 15 days). You’ll have unlimited downloads while subscribed. With this contribution, you collaborate to keep this site and make possible to add new maps and improve their quality. 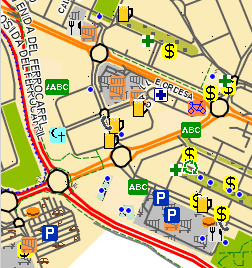 If you are an active OpenStreetMap contributor, that is, if you regularly contribute data to OpenStreetMap, the required amount in order to register is only 12 €. In addition, as a registered user you'll be able to access exclusive extra content, such as the maps of full continents like Africa, Asia, Europe, Oceania or South America or the map of the USA, Canada and Russia. You'll also have priority in getting support via page comments or e-mail. Make a donation of at least the amount stated above. If you pay by PayPal, wait until I send you registration form (usually you'll receive it in less than 24 h). If you pay by transfer, Send me a mail about your donation. If you are an active OpenStreetMap contributor, put your OpenStreetMap user name in the mail. As soon as I receive the mail I'll give you access to the register form. Fill in your data in the register page and wait for your account activation. Once I have activated your account, I'll send you a message. Then you'll be able to access the download of the extra maps. Registration process is usually completed in less than 24 h, but I can't guarantee that. So, if you need any map for an imminent travel, don't wait until last minute. I am looking for Africa Map. You must be registered to download Africa map. You have information on how to register above in this page.